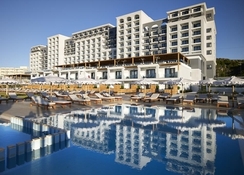 Mitsis Alila Exclusive Resort & Spa is a luxurious 5-star property, set on the foots of a sandy beach in the lively resort of Faliraki, Rhodes. 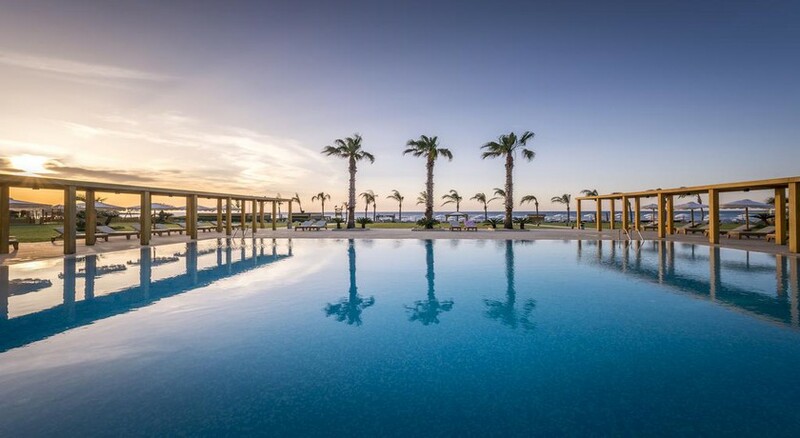 Providing a fresh and modern space that's matched with an authentic Greek isle experience, this fabulous hotel is an ideal holiday spot for couples and families. The hotel boasts 314 modern and spacious rooms with a host of world-class amenities ensured to keep your stay comfortable and well-catered. Splash in the outdoor seawater pool, whizz down water slides and try your hand at beach volleyball before exploring and indulging in the wide range of cuisines available at the in-house restaurants and a sophisticated selection of champagne, afternoon tea and wine bars. 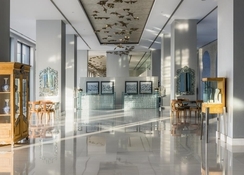 The Mitsis Alila Exclusive Resort & Spa is located in Rhodes and within close proximity to a number of attractions and places of interest such as the Afandou Golf course, Rhodes town (8 km), the Acropolis of Rhodes, Grand Master Palace, Modern Art Gallery, and Casino. About 4 km from the centre of Faliraki, you have plenty of options to shop, drink and dine in the surrounding area – not to mention the pristine beaches and fishing villages near the hotel. The nearest airport of Rhodes a 20 km drive from the hotel. The hotel offers a total of 314 luxurious guestrooms. Each room comes with 5-star amenities to make your stay comfy with a touch of luxury. The facilities include air-conditioning with individual control, heating, bathroom with bathtub and shower (some without shower), direct dial telephone in room and bathroom, mini fridge, complimentary refreshment centre, satellite TV, safe deposit box, internet access and a balcony/terrace. You can choose from a selection of Standard Rooms, Superior Rooms (with a sea view), Family Rooms and Suites. The hotel is booked as All Inclusive accommodation. Dining choices abound starting with the main restaurant that serves breakfast, lunch and dinner, with extended buffets and show cooking. There are 8 thematic restaurants all a la carte and air conditioned with varied cuisine including Italian, Asian, Mexican, Greek and more. But make sure to have a prior reservation, and there is an evening dress code in all restaurants and bars. And, if you are looking for more casual dining, try the Creperie & Gelateria, and hotel’s five bars. The hotel has an outdoor sea water swimming pool and a private beach with complimentary sun beds and umbrellas, and beach towels are provided with a refundable deposit. Additionally, for sports enthusiasts, there’s a mini soccer court, beach volleyball, water polo, table tennis, table football, air hockey, Billiards, Darts, horse & pony riding (on request with charge), gymnastics and aerobics. The hotel’s multilingual animation team provides entertainment day and night. Once a week, a Greek orchestra with local dancers invites all guests to a traditional Greek fest! We stayed at Alila the beginning of May and enjoyed amazing customer service and fantastic hospitality throughout our stay. Mitsis in genera, are an awesome group who now how to look after guests and nothing is too much trouble. Would highly recommend if you are travelllng to Greece this is the No.1 place to be and we will return without a doubt as it is outstanding. We return to the Alila every year. Why? It's because it cannot be beaten with any other all inclusive European hotel. Everything is excellent from the accommodation, the staff, food quality and variety to the drinks. I'd have no hesitation in recommending it to anyone. Perfect stay in a beautiful hotel 5star can’t wait to go back!!! !